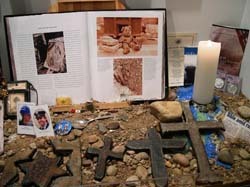 9/11 Museum Scores a Spot on Trip Advisor's "Top 25 Museums in the USA" List. One of Only Three NYC Museums to Make the 2013 List. Big things really do come in small packages; the Ground Zero Museum Workshop's inclusion in this year's coveted "Top 25 Museums in the USA" list just released by Trip Advisor is a perfect example. The tiny, unorthodox 1000 sq. ft. Museum in NYC's Meatpacking District was inspired by the small Anne Frank House in Amsterdam, Holland, states founder and curator Gary Suson, who served as the Official Photographer at Ground Zero for the Uniformed Firefighter's Association (FDNY). "My experience at Anne Frank House taught me you can have an emotionally powerful museum even if it is not huge in terms of square footage," says Suson, an FDNY Honorary Battalion Chief who designed the 5-Star rated non-profit Museum from the ground up. One of only three NYC Museums to make this year's list (also the FRICK and the MET), GZMW raises tens of thousands of dollars in donations for numerous charities, including the FDNY Foundation for the Children of Fallen Firefighters. "We are a small, non-commercial boutique museum that does tiny numbers but creates meaningful memories for our guests," says Suson, whose Museum allows visitors to pick up & hold WTC artifacts. Operating mostly by word-of-mouth and a shoestring budget, the Museum sells out well in advance and has become the "first stop" for tourists heading to the 9/11 Memorial Pools seeking to learn about the special stories that happened inside Ground Zero during the Recovery Period. "It connects everything for visitors. Just standing at the Memorial Pools doesn't really give one a sense of "what happened" so we feel we connect the dots, so to speak" says Suson. Operating tours in Italian, Spanish, French & English, the self-guided audio units describe stories in detail, including real sound effects from Ground Zero audio. "We are very honored to have been chosen by Trip Advisor and feel it's a testament to how hard we work to create an authentic, historically accurate Ground Zero experience." Tour guides at GZMW often joke to guests that the Museum is not much larger than the ladies bathroom at the MOMA. However, with 100 stories to take in, guests use up every bit of the allotted 2 hours. The Museum stays away from the actual "Day of 9/11" and focuses on the rarely seen "Recovery Period." Kid-friendly, GZMW contains no graphic images. "Our Museum is about healing as opposed to re-living the horrible day of September 11," states Gary Suson. "We have children as young as 5-years-old who are fascinated by the stories." The Museum also hands out free Hershey's Chocolates to it's guests as a nice touch. Former FDNY Firefighter Rudy Sanfilippo, who also served as Manhattan Trustee of the Uniformed Firefighter's Association and placed Suson in Ground Zero stated, "It's a little gem of a museum that not only educates folks about our Ground Zero world but also gives back to FDNY and 9/11 charities. I see only positives here." Ground Zero Museum Workshop is located at 420 West 14th Street, near The High Line Park, Meatpacking District and is open 7 days per week with multiple 2-hour tours. Reservations highly recommended. Get tickets by calling ZERVE at 212-209-3370 or buy direct online at ZERVE. Tickets are $25.00 for Adults and $19.00 for Kids-Seniors. Free admission for immediate family members of 9/11 victims.